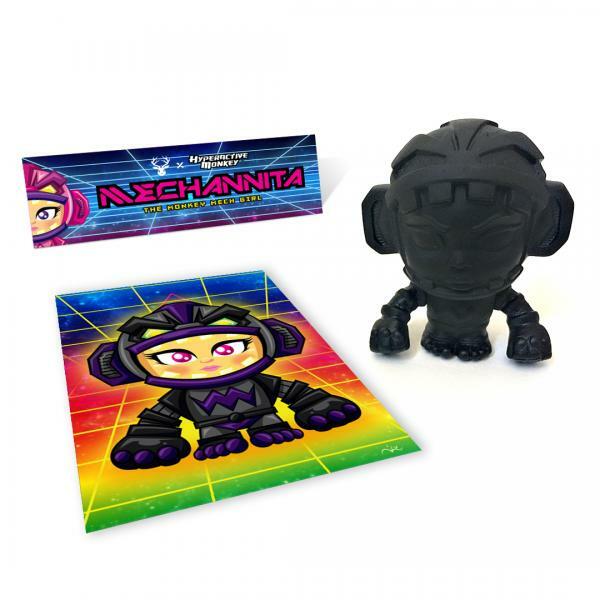 At San Diego Comic-Con 2017, Hyperactive Monkey will be dropping this con exclusive Night Ops Edition Mechannita vinyl figure - perfect for every galactic top secret mission! This release completes Hyperactive Monkey’s CMYK colorway series of The Monkey Mech Girl, and also marks the character’s final release. The Blot was super bummed to learn this news as I really dig this unique mini figure, and am proud to have one in my collection. The black San Diego Comic-Con 2017 Exclusive Night Ops Edition Mechannita vinyl figure stands 3.5” tall, features 3 points of articulation (arms and head), and comes bagged with a colorway specific header card and limited edition 5”x7” print. Collectors can pick up this awesome collectible at the Hyperactive Monkey SDCC booth #5640 for $10.